Kate Shannon-Easterbrook was born in Plymouth Devonshire c1853 based upon interpolation of the census records of 1861, 1881, 1891, and 1901. She was of Irish extraction and appears in the 1861 census as Catherine Shanahan with parents Joseph and Mary Shanahan, both born in Cork, Ireland. The parish registers in Plymouth - Church of England, Non-conformist and Roman Catholic have been searched for any record of the children born in Plymouth, or of their parents and no record has been found. No marriage record has been found in England for the parents. 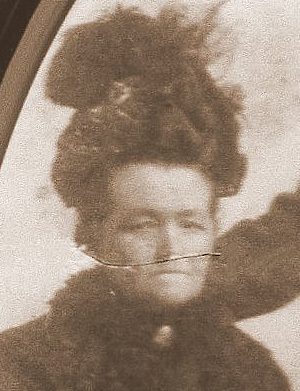 Mary Shannon Lodger Widow aged 45 Charwoman born Ireland Cork but no mention of her daughters. Kate entered the Greenwich Union Workhouse on April 24th 1873 described as "a servant established Church (i.e. C of E) aged 19" where she had a son George Shannon [1873Q2 Greenwich Vol: 1d, Page: 812] on 28th April 1873 whose father is unrecorded and the place where she was a servant has not been identified. She remained in the Workhouse until May 27th when she was discharged with her son George. [Admission & Discharge Register 1872Oct21-1874Aug16 X107/140]. It was not uncommon for the poor to use a Workhouse as a Maternity Unit instead of a hospital. We presume she was not living anywhere near her family - especially her mother Mary who would have been aged 46 at this time. As a spinster aged 22 Kate Shannon married George Edmund Easterbrook (1853-1886?) a bachelor aged 26 on 1st November 1879 at St Nicholas Deptford, Kent [1879Q4 Greenwich Vol: 1d, Page: 1318]. He is described as a Boiler Maker. The marriage was witnessed by the mark (X) of her mother Mary Shannon . The fathers were Henry Easterbrook a Baker (deceased), and Joseph Shannon a Carpenter. In the 1881 census the couple seem to have been living apart for there is a convincing entry for Geo. 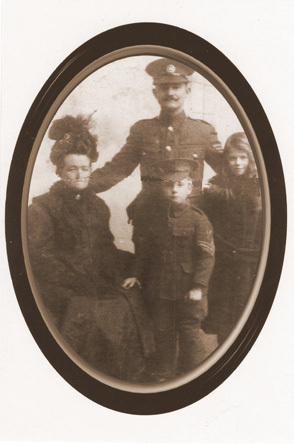 Edmund Easterbrook married aged 26 staying at the house of Henry Turton Keeley, wife and family at 7 Fountains Street Lambeth Surrey. His occupation is given as a Boiler Maker. An 1881 census entry[RG11/99 Folio: 90, Page: 39] at 25 Chesham Street Lambeth Middx in the household of Frederick Locker includes Kate Easterbrook as a Wet Nurse. She is described as: Kate Easterbrook a married servant aged 26 born in Plymouth, Devon. Her son George Easterbrook aged 9 is recorded as a lodger at 45 Butchers Row Deptford in the household of Nathaniel Nottage and family. Frederick Locker was married to Lady Charlotte Christian ?? in 1850. She was the 4th daughter of Thomas 7th Earl of Elgin. They had a daughter Eleanor Bertha Mary Locker(1855-??) - later Locker-Lampson. Lady Charlotte died on 29th April 1872 and Frederick Locker subsequently married Hannah J Lampson(1846-??) in 1874 [1874Q3 East Grinstead Vol: 2b, Page: 203]. 9 servants including Kate Easterbrook age 26, a Wet Nurse. Eleanor Bertha Mary Locker(1855-??) married Lionel Tennyson(1854-1886) in Westminster Abbey on 25th February 1878. Her first husband died on his voyage home from India on 20th April 1886. Her second marriage on 5th May 1888 at St Mary Abbott's Kensington London was to the Rt Hon Augustine Birrell. The Easterbrook family believed that the father of George Shannon(1873-1967) was of the Locker-Lampson household but this is unfounded speculation. Henry Easterbrook (1884-??) who had children Harry, May, Connie and Ivy. William Easterbrook (1881-1965) who had live children Martha(1906-?? ), William(1908-?? ), and Sidney. She was widowed in 1886? ; a possible death for George E Easterbrook is [1886Q3 Lambeth Vol: 1d, Page: 227] which remains to be verified. Elizabeth Shannon(c1858-??) aged 19 married Charles Bunsell(1855-??) aged 22 at Deptford St Nicholas. The fathers were Joseph Shannon a Carpenter and William Bunsell. The witnesses were William Richford and Kate Shannon. She later married Edward Ealy (1847-?1906? ), a widower aged 48, on April 16th 1895 [1895Q2 Greenwich Vol:1d, Page: 1511] at St Lukes Church; her stated age was 39. Her father was quoted as Joseph Shannon a Carpenter but not present at the wedding. Edward Ealy's father James Ealy (deceased in 1895) had been a Sawyer. 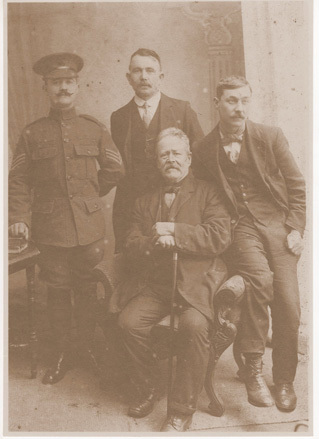 Edward Ealy was a witness at his step-son George's marriage in Sept 1900. They had no further children. Her parents - as stated on her first marriage certificate - were Joseph Shannon (c1830-??) and Mary Shannon (c1826-1908) who was born in Ireland and recorded as a widow in the 1891 census living with her daughter. Mary Shannon was later recorded in the 1901 census as a pauper aged 74 in the Paddington Workhouse. She died aged 81 in 1908Q1 [Paddington Vol: 1a, Page: 52]. Kate Ealy died aged 76 in 1932 [1932Q3 Greenwich Vol: 1d, Page: 749]. This information, published by Malcolm Rigg, about the Easterbrook Family could not have been assembled without the help of the four surviving Easterbrook cousins, whose assistance is gratefully acknowledged. The photos of Edward Ealy and Kate Easterbrook were provided courtesy of Sue Easterbrook.